The Airbus A320 family is a family of jet airliners. It only has two rows of seats, which means it is a narrow-body plane. The family is made by Airbus and it is made up of the A318, A319, A320 and A321, as well as the ACJ business jet. The A320 family is made in Toulouse, France, and Hamburg, Germany. Since 2009, a plant in Tianjin in the People's Republic of China has also been making aircraft for Chinese airlines. In June 2012, Airbus said that it would start making some A319, A320, and A321 planes in Mobile, Alabama. The planes in the family can hold up to 220 passengers and they have a range of 3,100 to 12,000 km (1,700 to 6,500 nmi). The range depends on the model. On 1 December 2010, Airbus announced a new version of the plane, called the A320neo. With the A320neo, new engines will be used (the CFM International LEAP-X and the Pratt & Whitney PW1000G) and some improvements have been made to the outside of the plane. Winglets have also been added, which Airbus calls Sharklets. The A320neo will use 15% less fuel than the current A320. Virgin America is the A320neo's launch customer. As of 31 December 2011, 1,196 A320neo aircraft have been ordered by 21 airlines, which makes it the fastest-selling commercial aircraft in history. As of June 2013, 5,635 Airbus A320 family aircraft have been delivered, and 5,443 of these are still being used. As well as this, 4,014 planes are on order. The A320 family's main rivals are the Boeing 737, 717, 757 and the McDonnell Douglas MD-80. The A320 was the world's first commercial jet to use a small joystick, also called a sidestick, to fly it instead of a normal yoke (a steering-wheel like device). This matched the new digital 'fly-by-wire' system, the first use of this in a civilian aircraft, which makes the A320 much easier and safer to fly. The A320 also has a full "glass-cockpit", where most instruments in the cockpit (the front part of the plane where the pilot is) have been replaced by television screens. Most of the technology first used on the A320 has been used in other Airbus aircraft made afterwards. Other manufacturers, like Boeing, have also used much of the technology like a glass-cockpit and fly-by-wire in the Boeing 777. The A319, A320 and A321 have engines made by two different companies; International Aero Engines (IAE) supply the V2500 and CFM International provide the CFM56. Over 54% of A320s in the air today have CFM engines. The significantly smaller A318 has either Pratt and Whitney PW6000 engines or CFM56-5. The PW6000 was not as good as expected and this may have reduced the number of sales; several airlines cancelled their orders before the more efficient CFM engine arrived. A Air Bishkek Airbus A320. The A320 has been shortened to produce the A319 and stretched to produce the A321. Recently it was shortened even more to make the A318. However this version has not sold as well and the only large operator is Frontier Airlines. These different versions are known as "A320 derivatives". When talking about all of them, they are known as the "A320 family" or "A32x". Changes in size are done by removing or adding sections of fuselage (the part of the aircraft passengers sit in) and adjusting the power of the engines. Airbus try to keep the airplanes the same where possible, to reduce operating costs. Pilots only need one licence (called a type rating) to fly all A320 derivatives. June 26, 1988 - Air France Flight 296 crashed into the tops of trees beyond the runway on a demonstration flight at Habsheim, France. Three passengers were killed. February 14, 1990 - Indian Airlines Flight 605, an A320-231 carrying 146 people crashed on its final approach to Bangalore Airport, killing 88 passengers and four crew members. January 20, 1992 - Air Inter Flight 148, an A320-111 crashed into a high ridge near Mount Sainte-Odile in the Vosges mountains while on final approach to Strasbourg at the end of a scheduled flight from Lyon. This accident resulted in the deaths of 87 of the aircraft's occupants (five crew members, 82 passengers). 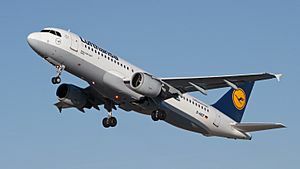 September 14, 1993 - Lufthansa Flight 2904, in Warsaw an A320-211 coming from Frankfurt am Main with 70 people crashed into an earth wall at the end of the runway. A fire started in the left wing area and penetrated into the passenger cabin. The copilot and a passenger died. March 22, 1998, Philippine Airlines Flight 137, an A320-214 crashed and overran the runway of Bacolod City Domestic Airport, RPVB, in Bacolod, plowing through homes near it. None of the passengers or crew died, but many were injured and three on the ground were killed. August 23, 2000 - Gulf Air Flight 072, an A320-212 crashed into the Persian Gulf on approach to Bahrain Airport. All 143 passengers and crew on board lost their lives. May 3, 2006 - Armavia Flight 967, an A320-211 crashed into the Black Sea while attempting to conduct a go-around following its first approach to Sochi Airport, Russia. All 113 passengers and crew on board lost their lives. The accident was a Pilot error / Controlled flight into terrain accident. July 17, 2007 - TAM Airlines Flight 3054, the A320-233 on the route, was not able to stop while landing at Congonhas International Airport in São Paulo, Brazil. It then crashed into a warehouse and a fuel station near the airport. The cause of the accident was the captain turning off the left engine and turning on the right engine to full, causing the plane to turn left and crash. All 187 passengers and crew died with 12 fatalities on the ground. May 30, 2008 - TACA Airlines Flight 390, the A320-233 from San Salvador overran the runway on its final approach to Toncontín International Airport in Tegucigalpa, Honduras, with bad weather conditions. There were five fatalities, including two people on the ground. On 28 July 2010 Airblue Flight 202, an Airbus A321 flying from Karachi to Islamabad, crashed in Margalla Hills in Islamabad, Pakistan. The weather was poor with low visibility. The aircraft collided with terrain after the crew ignored cockpit warnings to pull-up. 146 passengers and six crew were on board the aircraft. There were no survivors. The commander, Pervez Iqbal Chaudry, was one of Airblue's most senior pilots with more than 35 years' experience. 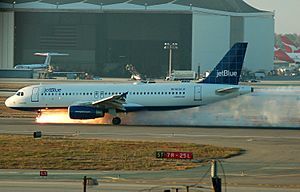 Seven incidents of nose gear malfunction, including JetBlue Airways Flight 292. This information comes from: Airbus. The A320 family cockpit commonality enables pilots to quickly transition among Airbuses. A320 parts are manufactured throughout Europe, like the horizontal stabilizer in Spain. Large parts are shipped aboard the Airbus Beluga. Alitalia was the second to receive the stretched A321, after Lufthansa. A US Airways A319 in America West heritage livery. The A319's wingspan is longer than the aircraft's overall length. A319 left wing with spoilers deployed during landing. A Spirit A320 being refueled and loaded with luggage. Air France was the launch customer of the Airbus A320. ACJ319 operated by the Austrian operator MJET. IndiGo has ordered 400 A320neo aircraft. Airbus A320 family Facts for Kids. Kiddle Encyclopedia.